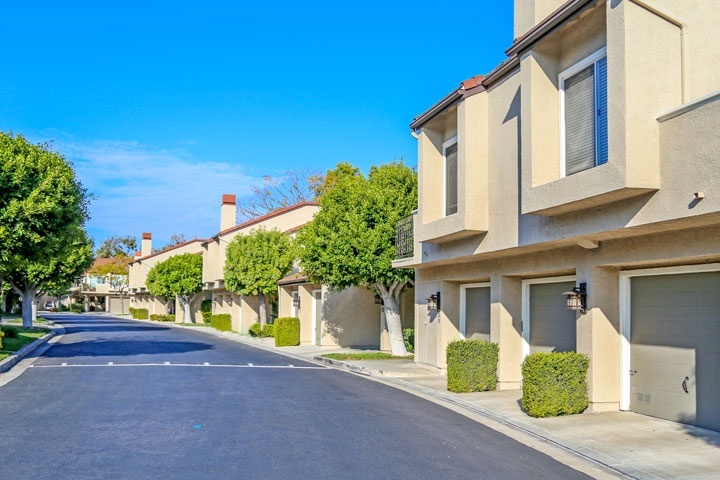 Princeton Townhomes are located in the coastal community of Irvine, California. The Princeton Townhomes neighborhood offers a prime location situated between the University Town center and the 73 freeway. The University of California, Irvine and the town marketplace are within walking distance from this location. The townhouses situated here were built in the mid 1980's and feature two to three bedroom floor plans that range in size from 890 to 1,500 square feet of living space. These are ideal properties for first time home buyers and those attending the University due to the low real estate price point. The Princeton Townhomes community has two monthly association dues required. The association provides access to four community pools, spa, tennis and playground area that's included on the monthly dues. Select units in this complex will offer wonderful city and sunset views with vaulted ceilings and attached garages. The neighborhood boundaries include Turtle rock elementary school in the Irvine Unified school district. Below are the current homes for sale and for lease in the Princeton Townhomes neighborhood. Please contact us at 888-990-7111 for more information on this community and any of the homes listed for sale here.